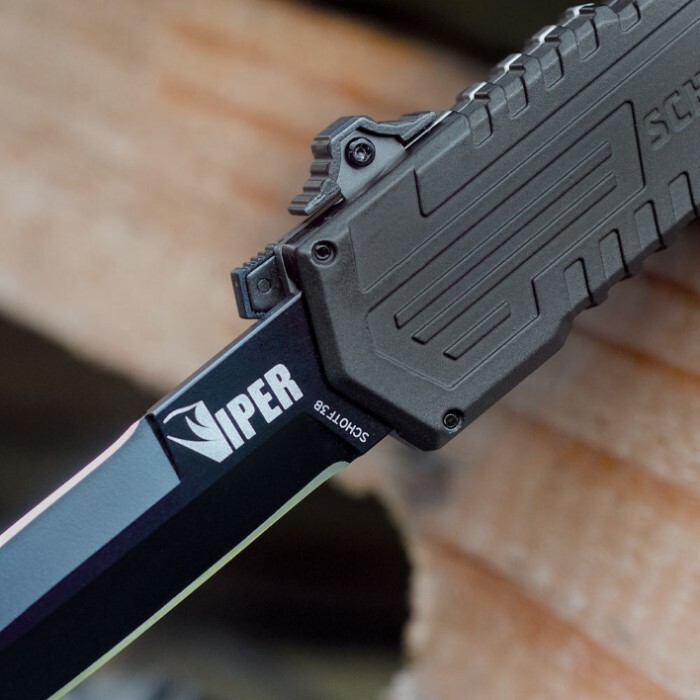 The Viper series of Out-The-Front spring assisted knives are the most streamlined OTF models yet! They offer a bayonet style, double edged blade, housed within a compact Aluminum case. The blade is forged using 4034 Stainless Steel. To open, start the process by pushing the blade forward using the handle's side access, and the spring assisted technically will do the rest. Once the blade fully extends, it automatically locks into place. To close, slide the blade downward using the side access, which will release the lock and move the blade back into the handle. There is a safety switch on the handle, and a red dot will be visible when the safety is off. 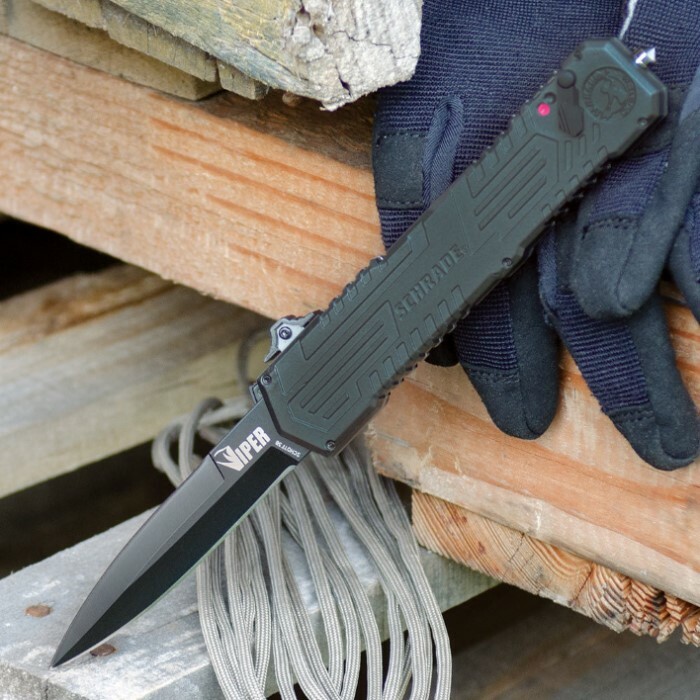 The handle also features a glass breaking spike and pocket clip. 3 1/2 in. blade, 8 3/4 in. overall opened. Cheap steel, the type used is just barely better than that used in replica fantasy swords. It is well made overall however, and a great improvement on the original design. have been looking for a new assisted open knife and bought this one. great knife. with a little practice you can easily open it with one hand. all metal construction. good buy!! The knife is well made - all metal construction, blade locks up nicely, etc. - but poorly designed. The switch mechanism travels down a slot in the handle the length of the blade; you must operate it from behind and keep your fingers out of the way. This makes it a two hand operation unless you operate it from an overhead stabbing position. The blade sharpens nicely, but is a little thin for self defense. You couldn't get a piece of typing paper under the pocket clip. It needs a lot of loosening. I think they should charge ten more dollars and make a really nice one or stick with spring assisted folders. The blade deploys rocket fast, but the awkwardness of operation makes it very slow to use. I saw a friend of mine purchased one of these knives I liked the way it worked with one hand the assist spring could be a little stronger though and I wish the overall knife was a little larger so all in all it's a good little knife. I was very happy at first but after only having it a few months it won't open. It happened once before and started opening again but now it won't open at all. Feel like I wasted my money. Awesome knife! I've been contemplating buying one for awhile, but man I'm glad I did. The handle feels great, the blade is SHARP! And it feels good in my pocket. 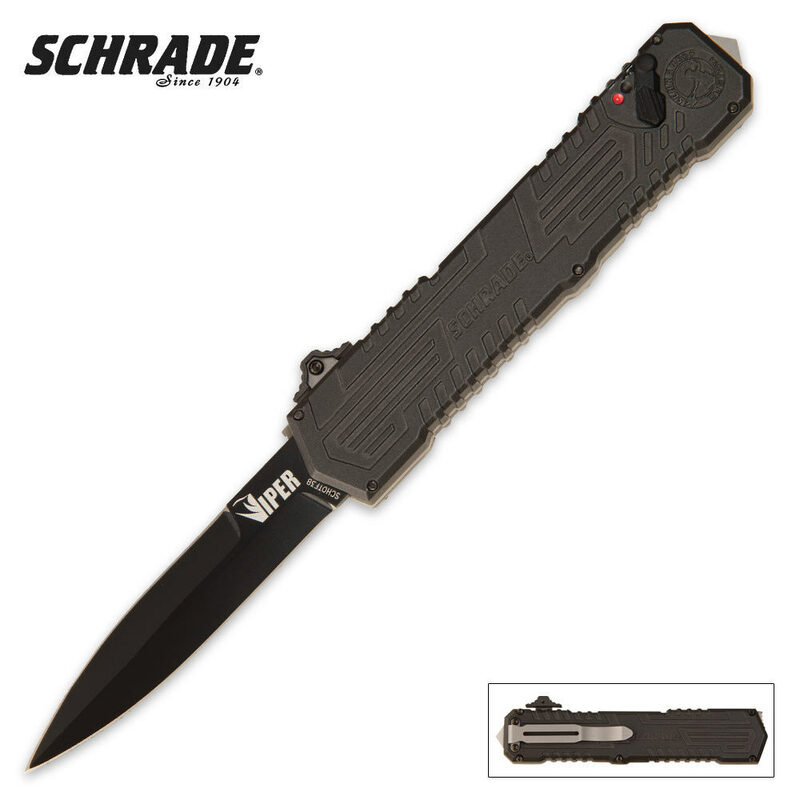 I would highly recommend this knife or any of the other Schrade Viper's to anyone wanting to add an OTF to their collection. Excellent knife! Got it for Christmas. Easy to work. Stays sharp and not too heavy to carry. The lock is awesome. Would highly recommend. GREAT KNIFE I WANT TO BUY MORE SOLID PRODUCT!!!!! !